This month we’ve been busy working on the first two manager features for the Tanda app. With full rosters and shift swapping, managers can step away from their back office and instead access the information they need to run a successful shift in their Tanda app. Read on to see the new features released this month a few sneak peeks at what else we have coming up soon. Sometimes even the best of employees are unable to work a rostered shift. With our new Shift Swapping feature, you can skip the ring around and tedious manual calculations to find a suitable replacement. Our app presents costs, rostered hours, and availability so you can make quick decisions. Shift swapping is live now in your app. For more information on how it works please read our shift swapping post here. 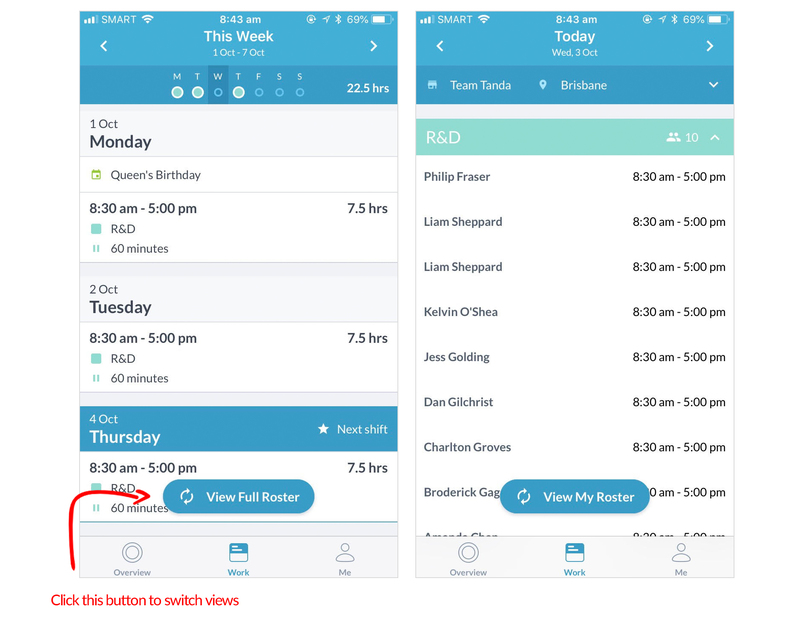 Since releasing the Tanda app, we’ve heard one consistent bit of feedback from managers and employees alike: “I want to view the full roster, not just my own shifts.” The great news is now you can! Easily see who are rostered to work in all the teams you manage on any given day. You can even switch between locations if you manage multiple. 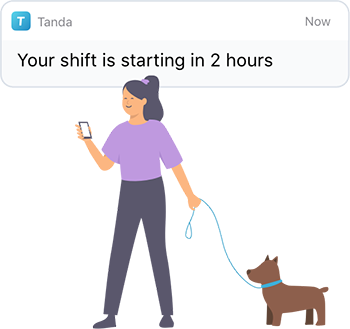 If you’re on shift and you want to quickly check who’s coming in next or who is due to finish soon you can simply pull out your phone and all the information you need will be right there in your Tanda app. The full roster will be visible to both managers and employees (only for their teams) if you’re an admin and would like to disable the ability for staff to view the full roster for their teams you can do so from the staff tab in your settings. 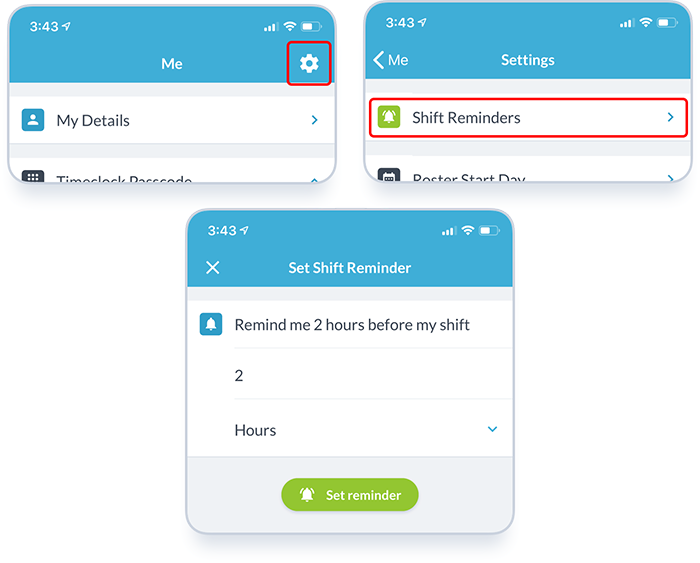 If you’ve ever had an employee not show up for work or show up late because they simply forgot about their shift then you will love our new shift reminders feature. 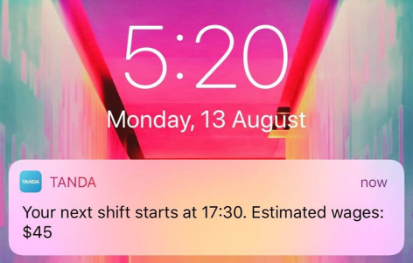 Staff can set up custom shift reminders in their Tanda app which will send push notifications alerting them that their shift is starting soon. These can be at any time interval they like whether that’s 30 mins, 1 hr or 2 hrs before. The reminder includes their start time as well as their estimated earnings. When we tested this feature out with employees we discovered that by displaying how much they will earn on a shift it means they are much more likely to get to work on time and will think twice before missing a shift if they know how much money they will lose by doing so. This feature is live now in the Tanda app. Save time while building your roster by automatically assigning staff to every vacant shift on your roster in one click! Using the cognitive rostering algorithm Tanda will figure out the best employee for each vacant shift and automatically assign them. 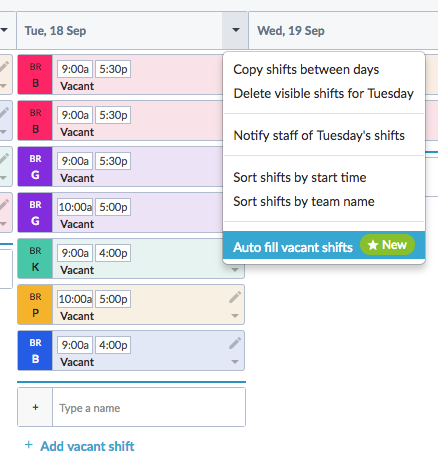 To test it out simply create a few vacant shifts on your roster, Then click the day heading at the top and click Auto fill vacant shifts, wait a few seconds and your shifts will have the best available staff assigned. We would love to hear any feedback you have on this feature, simply email leon@tanda.co. Here is a sneak peek at some of the features we are currently working on. The view will show both unavailability and leave requests on the same calendar. It will also show staff who are already on leave when approving requests. Just like leave requests, you will soon be able to approve or decline unavailability entries. We realise having oversight and control over these is equally important to your rostering and staff availability as leave. You will soon be able to add custom events that impact your business to days on the roster. You will also have the option to discourage staff from applying for leave or unavailability on these dates. Understanding your wage costs from a financial report is a bit like trying to piece back together a fruit smoothie that’s already been blended. Only a fraction of employers ever master their wage costs. Those who do are able to turn what’s viewed as a burden by their competitors into their best competitive advantage. A well trained and engaged workforce is a terrifyingly sharp weapon to take to your competition. The secret to it all is actually highly practical in application. It has been proven through decades of research that links highly engaged workforces to increases in topline revenue. We’ve worked with some of the most successful companies in traditionally low margin industries. Here are three of the most potent strategies you can apply to turn your workforce into your weapon in 2019. (1) Start measuring the future, rather than just reporting the past Financial reports are good if you want to see what happened yesterday. But taking control of wage costs is a long-term game. This means managing all expenses that a company bears for the employment of a staff member. This includes everything from gross salaries and benefits to other legal employer contributions. If you want to improve your future wage cost position, you need to start in advance. Building a conceptual report of your future wage costs works well because changes to the way you manage your workforce can take a long time to flow through. That’s especially true when it comes to agreed rostered hours, employment types, and hiring strategies, which take time to materialise into long term savings. You know what Christmas trade was like for 2018, so what will it look like in 2019 with higher wage costs and new employees? What could you change throughout the year in terms of things like the types of employees you hire and their agreed hours? The difference can be significant. Scenario test your forecasts based on employment type, age, level and test the impact of unforeseen overtime. Software will greatly speed this process up. If you’re only reporting on how well you’ve done, start reporting into the future in 2019. Plan to be successful in the future so you can start moving towards your goals now. (2) Tie up loose ends with a sharp ‘day of operations’ plan A well-run shift feels good, it’s like a hot knife through butter. The perfect win-win-win for business, employee, and customer. For some businesses, this is a random occurrence, but businesses that invest in the success of their workforce replicate this effect on a daily basis. It sounds simple enough: you need the right people in the right place at the right times, and management that leads the charge from the front. The reality is that planning and execution have many moving parts, which is why the day of operations plan holds key to your long term success. Staff levels should track your schedule, or day of operations plan, like clockwork. Any observed discrepancies should be viewed in light of demand being increased or decreased versus what was expected. At Tanda we we’ve quantified the ‘loose ends’ of a shift to be worth at least 1% of total payroll cost, based on clients who moved off manual timesheets. These represent just the small 1 to 5 minute variances here or there to what was planned, so with larger unexpected variances there can be a much larger than 1% difference between your plan and actual costs. Executing shifts with precision and recording times accurate to the minute is low hanging fruit in 2019. You can do this by setting goals for the time between trading or production end, and the official shift end, to encourage staff to finish diligently. If the original plan results in success, sticking to the plan guarantees it. Tanda’s Live Wage Tracker lets you see wage costs in real-time and adjust staffing levels to drive profitability (3) Return Managers to the Frontline If you want to sell more, make more, and ultimately do more in 2019, empower your managers to lead from the front. This is an opportunity that most businesses leave on the table. Frontline managers are your managers who lead shifts and teams, and they lead more employees than any other level of management. Remember, frontline staff have direct and measurable impacts on top line revenue and quality — they are the doers of any company. Research shows that the most valuable thing a frontline manager can do is allocate time to lead from the front, yet frontline managers spend more time on administration than on more important things like coaching and training. In 2019, make the admin the exception. Analyse what keeps managers in their office and automate it, so they can lead the charge from the front. Industrial engineers use the fancy term “task based observation”, but in practice finding out what to automate is as simple as analysing each piece of paper a manager touches and asking, “why?” Tanda’s Live Wage Tracker monitors your wage costs in real time as Tanda’s Award Engine calculates the exact cost of your wages for each minute of the day Master your Wage Costs Mastering your wage costs only takes a few key changes to the way you do business. First, investing in the right software will empower you to accurately forecast the next 12 months and beyond based on both reported data and common scenarios. Workforce success platforms like Tanda eliminate the need to guess how different employment and overtime levels affect revenue. Second, planning ahead and having contingencies ensure that every shift runs well and no resources are wasted. Besides having a sharp “day of operations plan”, preparing for staffing difficulties is possible with features like shift swapping that dramatically reduce no-shows. Third, ensuring that managers have a connection with both the staff and the customers gives you an edge over the competition. A manager that is not stuck in the back office understands concerns from all ends, and makes better decisions as a result. Help your business grow by implementing these three strategies today! Curious to know more about a workforce management system that can help your business get better this 2019? Book your FREE demo with Tanda today. Workplace automation, including the use of artificial intelligence and robotics, is expected to surge in the next three years, according to multinational insurance broker Willis Towers Watson. This development is unsurprising, as automating HR can lead to significant cost savings for your organisation, especially when implemented in managing attendance, eradicating benefit errors, and automating compliance. With the growing demand for advanced technology use, automating HR processes is not an eventuality, it’s a necessity. But streamlining processes and lowering administrative costs is only one side of the coin. Yes, owners, employers, and managers stand to gain a lot from ensuring that the business is ready for the future. But employees, too, are benefiting from workforce technology platforms that not only ensure wages are paid accurately and on time, but also introduce flexibility and increase transparency in the workplace. Employees love Tanda’s workforce success software because it empowers them in more ways than one. Read about how Tanda is making a difference in workplaces around the world. Error-free Timesheets and Pay Runs The first and most obvious benefit of workforce technology platforms is error-free timesheets and accurate pay runs. Companies that still use manual methods for timekeeping and pay calculation can cause employees to second guess if they’re really getting paid the right amount every time the payslip arrives. In fact, Australia recently had a spate of wage theft accusations, leaving in its wake damaged reputations and millions in back wages. Owners and managers commonly cite a lack of understanding of Australia’s complex award system as the reason it happens. Read more: Taking Back Time: Solving the enduring wage theft problem in Australia Switching to the Tanda employee time clock app ensures staff that their shifts are recorded accurately throughout the pay period. Timesheets are processed with Tanda’s award interpreter, to account for modern awards of Fair Work Australia as well as other enterprise award agreements. This is then exported in a format compatible with a host of payroll integrations, making pay runs quick and reliable. This increases the level of trust and transparency between employers and employees, which in turn increase productivity and engagement in the long run. Better Work-Life Balance When employees have a healthy work-life balance, they become more fulfilled with their work, and more invested in the future of the company. There are a number of ways flexibility can be introduced into a company without hurting the bottom line. For instance, Tanda’s unavailability calendar feature lets employees tell their managers whenever they might not be open for shifts. This helps the company create rosters around each person’s unavailability. Another feature, leave management, optimises the leave request process and lets staff file requests via the web browser or employee app. For some companies, more novel solutions like shift swapping are providing employees with more options to achieve better work-life balance. It allows shift workers to trade shifts with one another when the need arises. This lets shift workers strike a balance between their personal commitments and work responsibilities. Tanda’s shift swapping feature that integrates into its time and attendance web and mobile apps. 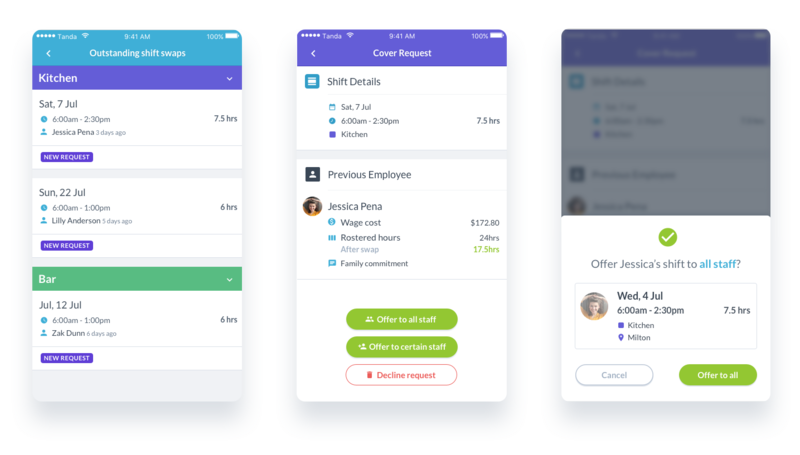 It lets staff request to drop or cover a shift right from their mobile phone, making it easy for them to start the swapping process. Read more: Achieving Workforce Success: Shift Swapping for Managers Reliable Rostering and Communication Employees need to know their schedule well ahead of time so that they can plan their upcoming week. Tanda’s web-based rostering software cuts down the time companies spend making the weekly roster. Cognitive Rosters® can be connected to your existing roster templates for the predictive suggestion of staffing requirements. Once approved, Tanda sends the roster to staff via SMS, email, or employee app. Employees can then inform their manager of any leave requests or else apply for a swap, dramatically reducing the chances of unfilled shifts throughout the week. Proper rostering is extremely important because overstretched employees aren’t productive. Too few staff on a given shift affects how they engage customers and respond to demands. Tanda’s Predictive Workforce feature uses sales data from the business’ Point-of-Sale (POS) to give an accurate forecast on how many people are needed on any given shift. During the day, Live Insights can be used to make key decisions on whether to call more people in, ensuring that the high quality of operation is sustained and uninterrupted. Read more: Introducing Live Insights: Using real-time staffing to secure your business Transparent and Engaging Workplace According to a survey done by Interaction Associates, 86% of employees say that they are more productive if they trust their employers. A separate study by advocacy group Trust Across America found that trustworthy companies outperform companies in the Standard & Poor’s (S&P) 500 Index. Building that kind of game-changing trust starts with transparency within the organisation. Employees must know that their company is working in the interests of all and they are open about the information that matters to them. With a world-class workforce success software like Tanda, employees have access to a portal that lets them know their time and attendance records, time off allowances, and upcoming shift schedules. It also increases employee engagement in other ways, like clocking in by taking a selfie on the Tanda Time Clock. Starting the workday with a smile can change the employee’s whole perspective, which can lead to a better rapport with customers and fellow coworkers. And with Tanda doing most of the admin work, employees have more time to do the things that matter to them. Read more: Crafting Workforce Success at Windsor Alehouse Why Workforce Software Matters For the modern employee to do their best at work, they need to feel that the company is supporting them and is willing to adjust to their needs from time to time. They need to know that the company they’re working for pays them correctly, supports their life commitments, and effectively communicates with them at all times. Companies can make all this happen by moving on from outdated processes that bogs down human resource management. By using workforce management software, employees are more motivated to work, empowered by a platform that allows companies to drive trust, engagement, and the ultimate employee experience. Ready to find out what Tanda can do for your business? Book a demo today. Should you approve shift swaps at work?